Good financial management necessitates that you get control over your spending. There is no lack of things to distract us and to spend our money on! use your resources to advance God’s Kingdom. The achievement of the majority of your financial goals will depend on your ability to save, and therefore, your ability to control your cash. You can structure your bank accounts to assist you in regaining control of your cash. There is no perfect structure, but there will be one which works best for you and your family. Whatever system you develop should be simple, easy to use and should not create unnecessary paperwork. The diagram below illustrates a simple bank account structure that allows you to manage the cash and will assist you in achieving your goals. This is the account that receives the majority of your income, such as your salary and any other payments you receive, i.e. your ‘cash inflow’. From there, the money is disbursed according to your needs and goals. 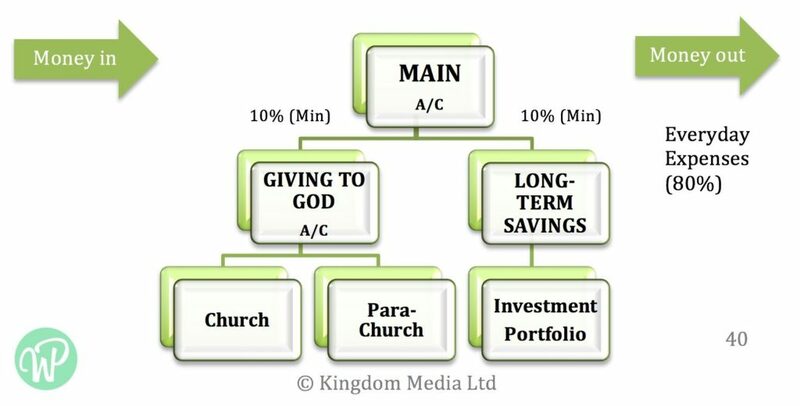 I suggest that you follow the principle of living on 80% of your cash inflow with the remaining 20% allocated between “Giving to God’ and “Long-Term Savings”. This is where you allocate funds which you will “Give to God” via the Church and/or various para-church organisations or faith-based ministries. I recommend that you endeavour to allocate at least 10% of your disposable income to this account. Hopefully, this fund will normally have a small balance, as I suggest that you disburse the money when you receive your income. 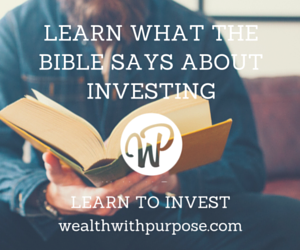 If you are a very disciplined person, you might not need this fund as you will transfer your “Giving to God” funds directly from your main account. This account will help you to achieve your long-term goals. Try to allocate at least 10% of your disposable income to this fund. From there, you can disburse the money into longer-term investments such as shares, real estate or equivalent assets which are appropriate to your goals. It is advisable that you have an “Emergency Fund” as a subset of this account. This will provide you with sufficient money in the event of an emergency. Cash equal to the value of six months living expenses should be your target. One of the simplest ways to get control of your cash and to increase your chances of achieving your long-term goals is to automate your finances. For example, if you are paid on the 15th day of the month, arrange an automated direct debit for the next day, to transfer the funds automatically to your long-term and “Giving to God” accounts. – “out of reach” or at least, harder to get at. The idea is that you only leave money in your everyday account for your living expenses. For most of us, the temptation to spend on a credit card is very great. In reality, it is money we don’t have and there’s a significant risk that we’ll accumulate debt very quickly. To avoid this problem, I recommend switching to a debit card. Most banks offer a Visa or MasterCard Debit card so that you are still able to make online or other transactions, but the money comes out of your savings account rather than a credit facility. Hence, you are spending money that is yours, rather than incurring debt. – some have points based programs. However, most points based programs are not profitable for you and just encourage unnecessary spending. If you use a credit card, pay the full balance each month to avoid paying interest. After all, interest is dead money, is dead money! Crises can also arise when both spouses are spenders, very little is saved, leading to crisis situations or non-achievement of long-term objectives. One solution to this problem is to set up additional accounts, one for the husband and one for the wife. Each spouse is allocated an allowance, whether weekly, fortnightly or monthly, but generally based on when income is received. This allowance is known as your “fun money,” i.e. cash that each partner can spend without consulting the other. The important thing is that you both agree on what the allowance should be. Your everyday expenses will still run through the main account which, in the case of couples, should be held jointly. You don’t need many accounts. I’d suggest no more than three to prevent excessive paperwork and unnecessary complications.